NOW with StenoWorks' exclusive shorter depth of stroke modification (FREE). Get the option of a short depth of stroke and watch your speed increase. 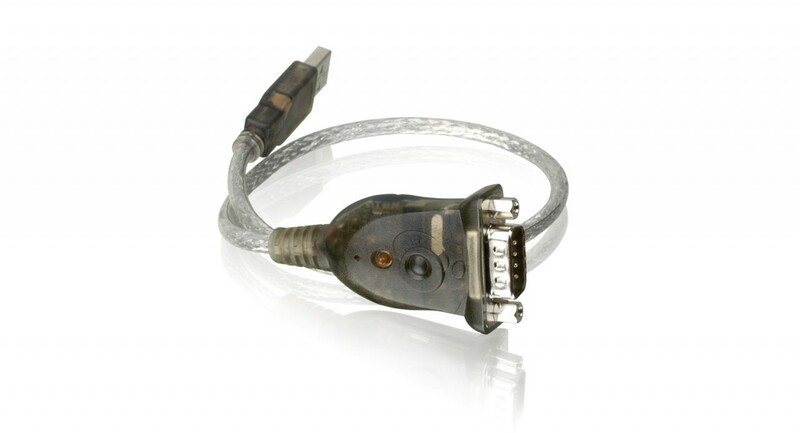 The Elan® Cybra® features USB and serial connectivity. The Elan Cybra® student version is a paperless machine for students and captioners! Refurbished by StenoWorks with a two year warranty and a four year trade-in guarantee. The major advantage to going with this writer is the excellent smooth touch. The touch or feel is similiar to the Elan Mira high-end professional models. Use the same technology while in school that you'll use as a professional. Watch your speed and accuracy climb with one of the lightest touches of any machine. Reporters! Here's your steno tip from the Guru: The Elan Cybra Student Model works great using the USB cable(included) with Case Cataylst® and Eclipse®. 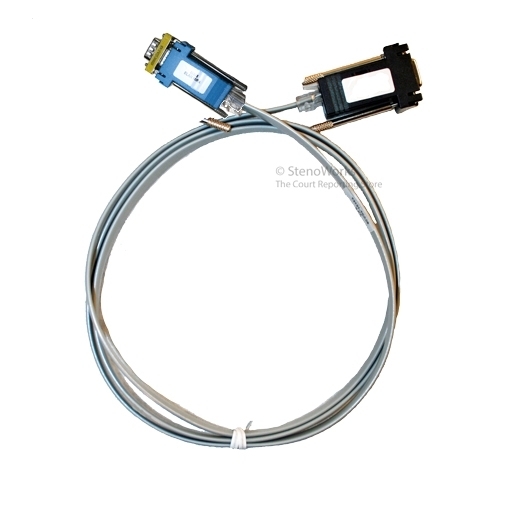 If you intend to use a different CAT system like Stenovation DigitalCAT® or Apieron SmartCAT® software then you will need to purchase the serial realtime cable and a USB to serial adapter. Machine does not have an LCD screen to view notes so it's best used with a computer in realtime. Could be used for captioning or in a professional setting with an extra back-up source like a digital recorder. Save with our low price guarantee. Designed especially for steno-captioners, steno-interpreters, steno-transcriptionist and e-students. Please make sure that your school or program allows you to use a paperless writer. Here's some paperless questions answered. No paper! Write directly to memory or computer with no paper tape. You save money and reduce noise. No ribbon! No paper means no ribbon...with reduced cost and upkeep. No platen! No paper, no ribbon means no platen! Reduces the need for contact re-adjustment since ribbon and paper are no longer part of the adjustment equation. No grease! No platen means no grease and reduced noise. Spend less time taking care of your machine and more time getting your work done! Introducing the innovative SmartStroke stroke-sensing technology that evaluates your hand-to-hand movement for cleaner strokes, resulting in better translation than ever before. Revolutionary AccuDial is a feature that lets you precisely set the depth of stroke for each individual key and easily change your adjustments over time to accommodate changes in your writing style. Check the status of your battery, RAM level, realtime indicator and key contacts on the LCD indicator. You can easily monitor the status of your machine. Speaking of RAM, the Cybra has memory to hold up to 50 pages so that you can later copy a job to your CAT software for translation and editing. Typically, though, the Cybra is used for strictly realtime applications such as CART (Communications Access Realtime Translation), steno-captioning and captioning where you are writing directly to the computer for immediate translation and display. Operate your Cybra for up to 40 hours or more on a single battery charge. Since the battery uses NiMH technology, it is less likely to develop a 'memory' if you charge it too often than other battery types. It can be recharged overnight using the standard A/C battery charger/adapter. Depth of stroke is now modified to give you a more shallow option. Stroke pressure to make the machine comfortable for your style of writing. Adapting some newer technology for connecting to your realtime computer, the Cybra has a USB port in addition to the regular 9-pin serial port. Trade-ins: Have a trade-in? 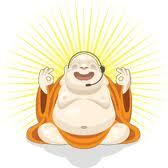 Get a trade-in quote within 24 hours. 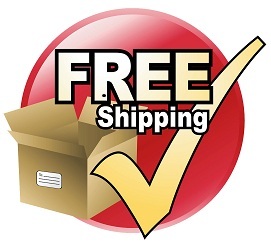 Just fill out our sell-your-stuff or an additional charge. 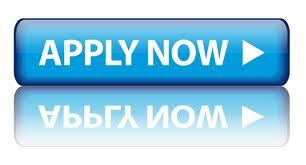 Use our Rent-To_Own program to get this writer for just $225.00 deposit and $56.00 per month. 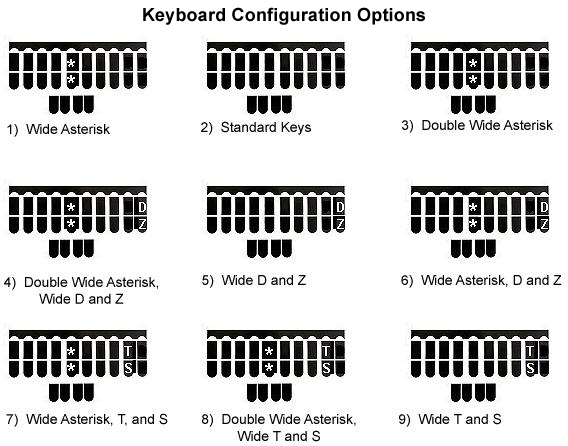 Here's a chart to help you select a keyboard configuration. Selecting keytop configurations can be confusing. Our recommendation is that if your present writer is configured a certain way then select the identical configuration. It can be difficult to get used to something different. If this is your first writer than we would suggest talking to your school or teacher and asking what they would suggest.